Then build the project. 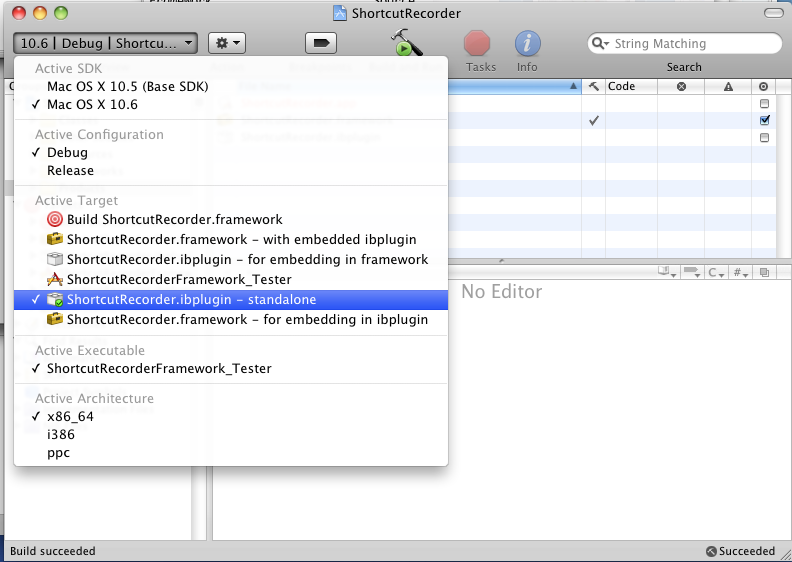 Once successful, navigate to the shortcutrecorder’s project directory in Finder, open the build/Debug folder, and double-click ShortcutRecorder.ibplugin. It will open silently in Interface Builder. Now go back into X-Code, close the shortcutrecorder project, and Clean All Targets in the Sequel Pro project. Once done, click ‘Build and Run’ and you should see a fresh copy of Sequel Pro running in your dock. Interestingly, the Sequel Pro source tree includes the ShortcutRecorder .ibplugin, in Frameworks/ShortcutRecorder.framework/Versions/A/Resources/ShortcutRecorder.ibplugin (it gets stripped on build). The reason it’s in that particular location is that Xcode/Interface Builder are usually smart enough to pick up .ibplugins in those locations – we include the BWToolkit .ibplugin for the same reason, for example. Unfortunately, as you’ve found, this seems to glitch out occasionally – sometimes a relaunch lets it pick it up automatically, sometimes opening up BundleEditor.xib will let it pick it up, and the good news is that once it’s found it, it won’t need to look for it again.